Thousands of dogs drown in backyard swimming pools annually (actual numbers are unknown because most incidents go unreported). The problem is that many dogs can’t swim, tire easily when trying to swim, or panic and go under. Here are some safety tips for protecting your dog around pools this summer. Tough breeds like bulldogs, dachshunds and boxers lack the thrust they need from their short legs to swim. 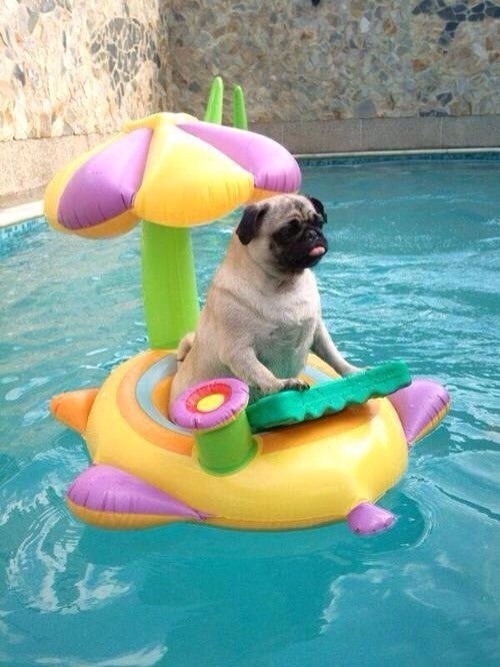 Short-faced dogs like pugs tire easily and small dogs like Maltese and Chihuahuas are easily chilled or frightened in the water, and can panic and drown. Dogs with long, heavy coats have a difficult time swimming. Many dogs drown because they become tired, disoriented and panic as a result. If your dog is like most, he’ll want to join you in the pool. Your dog may be a bit apprehensive about entering the water, so you’ll need to teach him to swim. Stay with your dog in the water at these early stages and teach him how to safely leave the pool on his own. Never leave your dog unsupervised around a pool or spa. He can accidentally fall in and panic trying to get out. If you make frequent trips into the house while your dog’s in the pool, get a pet life vest and make sure it fits him properly before leaving your dog alone. This added level of protection will allow your dog to stay in the water longer and keep him afloat while trying to get out of the water. 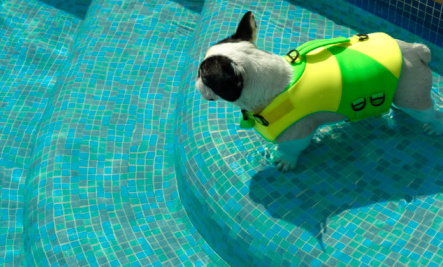 Canine Splash, LLC., a recreational swimming center for experienced pool or deep water swimming dogs, recommends that dogs wear life vests around the pool because they provide the buoyancy, confidence and protection dogs need to stay out of trouble. Canine Splash likes vests that come with a handle, in case your dog panics or is unable to stay afloat. The handle lets you pull your dog out of the water by hand or long pole. When dogs panic they can claw and bite you. The handle limits their ability to do that. 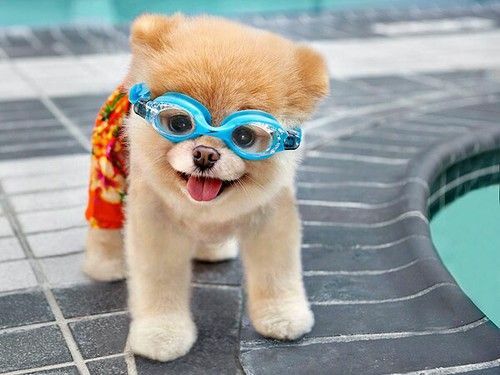 Dogs should also be familiar with the pool and its equipment. Canine Splash recommends that pools be equipped with ramps or docks. We may be able to navigate steps and ladders, but dogs can become frustrated with them and panic. You can also get a tight fitting pool cover to keep your dog out of the pool while you’re away. A safety device every pool owner should have is a pool alarm. If any object of a certain weight enters the water, a loud alarm warns you. These function much like a baby monitor, with a remote receiver inside the house. Check the weight specifications on these monitors and make sure your dog is heavy enough to activate the alarm. Make sure you dog is properly trained to respond to a strong recall. This will ensure that when it’s time to come out of the pool, your dog will promptly obey you. Finally, as a responsible pet owner, take the time to enroll in a Pet First Aid Class. You’ll want to be prepared for any pool emergency. Many Red Cross offices offer Pet First-Aid classes. Learning pet CPR could save your dog’s life. Lastly, be sure to rinse your dog with fresh water after he comes out of the pool, since pool chemicals can irritate his skin. This article was originally written by Alex A. Kecskes and appeared here. Labor Day 2018: What is the US holiday and why was it created?